Sewage Treatment Plant #2 (STP-2) is the biggest sewage treatment plant in Laughing Waters, sized to treat 40,000 liters and day and use it for various purposes. And to use the STP space for activities too. The design of STP-2 was approved at the time of STP-1. Problems with STP-1 delayed the entire project and increased costs put the entire project on hold. Fundraising carried out in Sep 08 and the appointment of a new sub-committee has put project back on track. The plant is anaerobic using no energy. Now it has become an aggressive experiment in urban sewage treatment and reuse. The plans are to treat and reuse all the water (> 20,000 liters a day). And more ambitious plans are to use the STP space for community activities. People seem to object to the constant odour emanating from the partially treated water let out in the park. If often foams, but kids playing football and basketball unconcerned, not do all the walkers object strongly enough to do something. I visited the LW STPs with Rajesh and on 10th main outside the STP where treated water was being let out into the internal storm water drain we noticed a foul odour. It seemed to be getting some aeration as it went down the storm water drain - smelling strongly near the main road and less near the STP (5th cross). We noticed that the waste water was going straight down the borewell due to a hole in the borewell chamber next to the storm water drain. The estate manager was called immediately and promised he would plug the hole. Chairman of the Karnataka State Pollution Control Board (KSPCB) Dr. Vaman Acharya and his team visited the Laughing Waters STP's among other sites in Whitefield at the invitation of Rajesh Shah. Of interest was also the solid waste segregation and processing plant co-located with the STP. At the invitation of Rajesh Shah, we visited STPs in Whitefield, including all the STPs in Laughing Waters. We took a water sample to test at our lab. Test was conducted for all 3 STPs. 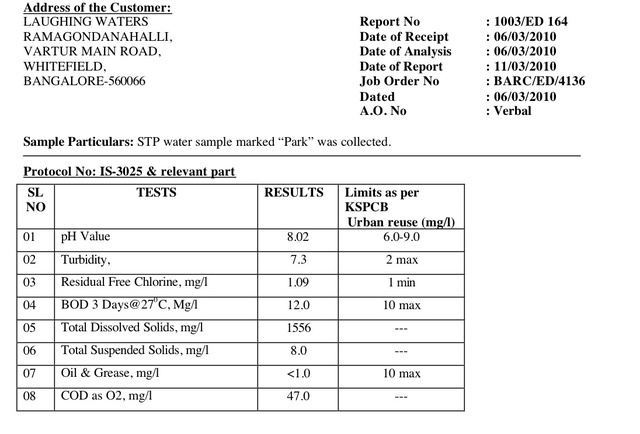 Result for this STP attached. 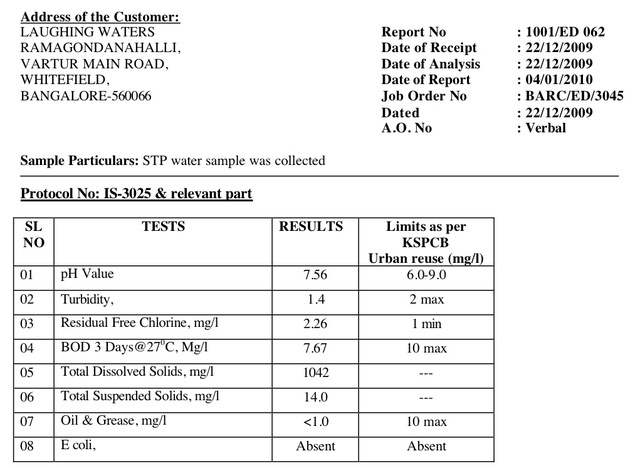 As part of the completion of the STP, a water quality test was conducted. The good news of the day was that finally the STP-2 treated water made it to the park. The old septic tanks at STP-2 were cleaned up and being filled for the past 10 days. The old septic tanks at the park (designated as the site for STP-3 which was scrapped) were emptied and cleaned. Dhaval and Rajesh were definitely happy as the water gushed into the park tank. Now the final chapter is to create the drip irrigation system and use our treated water to green our park and reduce borewell water use. a. The outlet level (of treated water) is higher than the outside storm water drain level. As a result, we ARE NOT dependent on pumping the water continuously unlike STP1 for discharge of treated water and hence backflow will not happen. b. This also gives about 30% more storage capacity for treated water at STP 2 itself as we have decided to convert the existing septic tank to storage tank. However, we will have to recast the roof slab of the storage tank. 2. The slab size of the STP2 was redesigned to accommodate the possibility of future structure (such as swimming pool) on top of the parts of STP (Settler and one-fourth of the remaining structure). This was essential to be done for any future plans for the site. · A delayed schedule (we also recognize that the consultant/contractor team has used this as an excuse for covering up some of delay from their side, but our view is that a better design is a preferred outcome) – new completion date is May 15. · A revised project cost due to some increase in scope (Rs. 38.5 L for construction) – details given below. Project cost will change from original Rs. 37 L due to one subtraction and some additions as shown below. 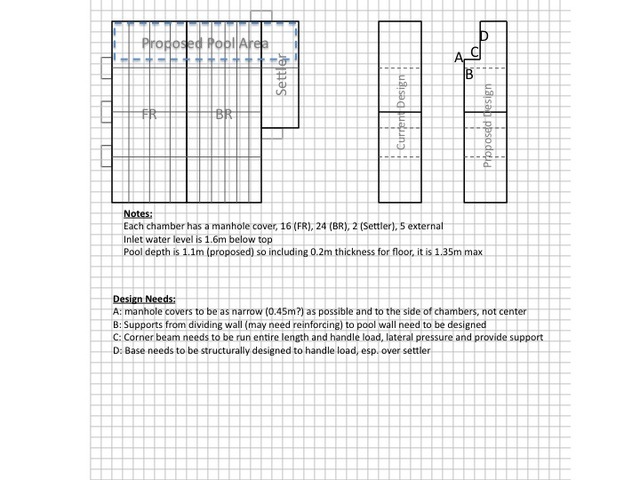 We save about 1.5 L due to elimination of the STP3, but we will pay 3 L extra for items that were not in the original scope (1 L for the storage tank slab and 2 L for the strengthening of part of the roof structure for holding future swimming pool. This cost cannot be deferred). In addition, the consultant fee is revised up from Rs. 30 K to Rs. 75 K to factor in all the spec changes. However, to make this agreement work, we have to provide the remaining payments in a timely and efficient manner to prevent any scope of further delay and arguments (We do not want the contractor to come back and say that delay is due to non-payment). The agreement with the contractor is that he will be paid one instalment (about Rs. 6.6 L as shown below) on May 2nd (when he should be ready to cast the slabs) and the final payment on completion (earliest May 16). Please treat this as advance information for timely processing of payment and will be submitting the detailed payment note in the prescribed format in due course. We appreciate your support through this arduous project and anticipate continued cooperation till the finish. We appreciate the help provided by Tharun in the final stages as a facilitator. Paradigm under Iqbal's supervision has taken detailed measurements of the site and come up with detailed drawings. Of course, no changes can be made to the structure which is already completed, but it does provide info on all the internal piping. Some of these are laid out and will need to be changed. With the lack of a place for a clubhouse, Rajesh has proposed a revolutionary idea to build a swimming pool and a club house on top of the STP. Incredulous and resistance and emotions are par for the course for his ideas. However, the first step is to design in the possibility that it could happen. 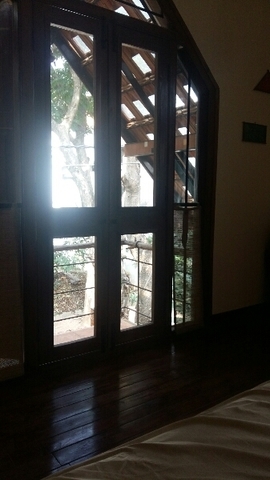 To do that the openings of the STP have to be moved around so that there is space. And that the roof of the STP is strengthened with structural engineering input to support the future load. The attached drawing will help garner input. It is hard to find structural engineers in Bangalore! We have connected with Mahimtura and Sons, a civil engineering firm in Mumbai. Digging work has started in full swing. 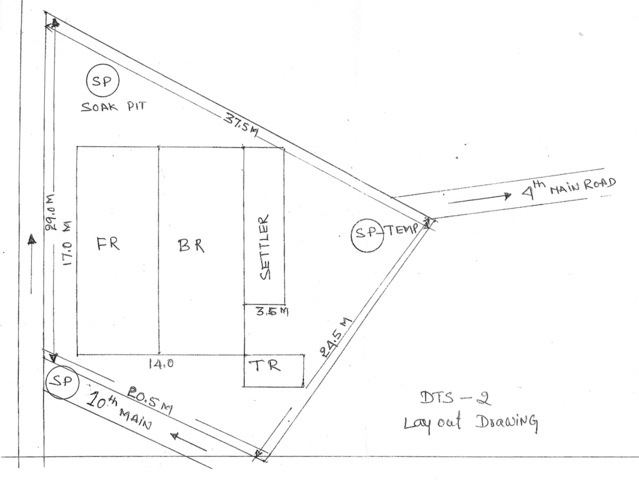 In the absence of civil drawings, the contractor sketched out the plan on a rough piece of paper showing the outline and approximate dimensions.